In the Narcissus Myth recorded by Ovid (1984), Liriope was raped by the river god Cephisus where she conceived and gave birth to Narcissus. When Liriope asked the prophet Tiresias about her son’s fate, his message was clear: Narcissus will live a long life as long as he doesn’t get to know himself. Narcissus became a very beautiful young man with many admirers who followed him but in his arrogance pushed all of them away. Echo, a girl cursed by the goddess Hera to repeat the last words of what she heard, fell in love with Narcissus and pursued him intensely. As Narcissus wondered around the woods he sensed Echo’s presence and he called out to her but Echo just kept repeating his last words. Like what the psychoanalyst does in therapy, Echo reflects the Narcissus’ questions back at him without introducing anything new. Becoming a mirror to the analysand the psychoanalyst, like Echo, follows the analysand wherever he wishes to go. When Narcissus asked her to come forward and meet, Echo made the fatal mistake of revealing herself and jumping into his arms, intruding upon the safe distance the withdrawn Narcissus implemented on himself and the world around him. The action frustrated Narcissus who shouted “Hands off!…May I die before I give you power over me.” Echo left devastated and heartbroken. She withered away, her bones became stones, and what was left was her voice echoing in the woods reminding her tragic story. When another betrayed admirer, Ameinias, prayed on goddess Nemesis to avenge Narcissus, his prayer would soon be answered. Narcissus approached a pool of water and then he saw his own reflection in the water not recognizing that he was looking at himself. He fell in love with the reflection, staring endlessly, until he pined away and transformed into the flower that bears his name. Like in Narcissus’ case, narcissists may cause frustration to the people around them by their complete arrogance and self-absorption. These reactions are perfectly understandable but I would ask you to consider the myth of Narcissus next time you meet such person. Narcissists may be suffering more than we ever thought of. 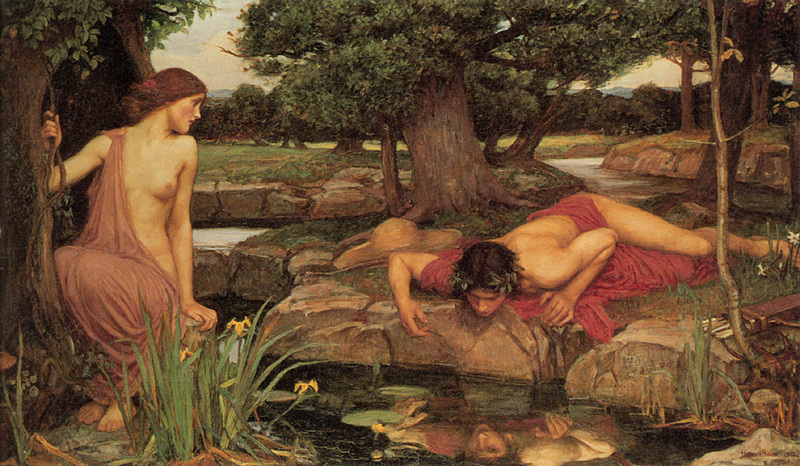 Seeing and getting to know themselves is very scary for them and that’s understandable; just think of Narcissus’ fate.